The IETM is not a replacement for the standard product manual. 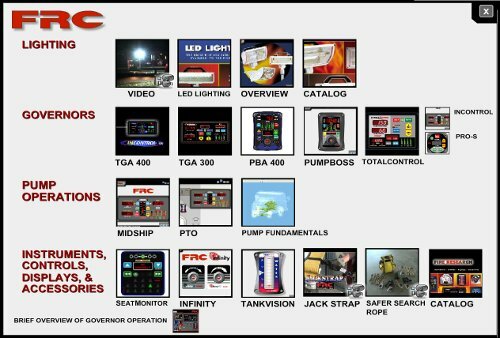 In addition to the standard product interactives, FRC has also included two general overview programs for midship and PTO pump operation which may be of use to our customers as a training aid. Even if you aren’t interested in FRC products, you might find these sections of interest. note: Catalogs for Lighting and Electronics linked inside the IETM are now out of date. Please see the catalogs page for updated catalogs!